We spend a lot of time in our cars here in the Alexandria and DC-area. Why not make that time as enjoyable as possible with a deep cleaning auto detail service! You will be amazed at the transformation. It’s not only nice to slip into an amazingly clean car, but car detailing has some practical benefits as well. A detail service can help preserve your car’s paint condition, maintain an immaculate interior, and preserve your vehicles value. We have many different car detailing services to meet your needs and budget – from complete car detail, exterior detail, interior detail, to hand wax, upholstery cleaning, headlight restoration and more. Although walk-in appointments are welcome, scheduling appointments for these services is recommended. Prices may also vary based on size and condition of vehicle. Please stop by, call us, or make an appointment online. Purchasing a Detail as a Gift? You can make an appointment for and pay for the detail by clicking on the "Book Now" button below (don't worry, the recipient can easily reschedule) OR you can stop by and purchase a Gift Card! Purchase a Detail Package and Save! Purchase three Yates Signature Details and save 10%. Purchase six and save 15% - that's nearly $270 in savings! Stop by or give us a call today about purchasing a Detail Package. Includes complete hand wash, clay bar procedure, wheels and tires treatment, interior vacuum, shampoo carpets, clean door panels and jambs, interior and exterior window cleaning, 3-step compound-polish and clear coat wax and vinyl and leather treatment as-needed. Includes complete hand wash, vacuum interior, clean and wipe down dash and consoles as-needed, interior and exterior windows, wheels and tires treatment and one-step hand wax. Includes complete hand wash, vacuum interior, shampoo carpets, clean and wipe down dash and consoles as-needed, interior and exterior windows, clean door panels and jambs and condition upholstery as-needed. 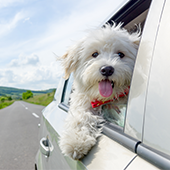 De-dogify your car with a complete hand wash, vacuum interior, shampoo carpets, clean and wipe down dash and consoles as-needed, interior and exterior windows, clean door panels and jambs and condition upholstery as-needed. Includes a complimentary Dog Dish menu item from Lena's Wood-Fired Pizza & Tap for your dog! Includes complete hand wash, 3-step compound-polish and clear coat wax, and wheel and tire treatments. Includes complete hand wash and shampoo and deep cleaning of cloth seats or clean and condition leather seats. We can restore headlights that have become discolored or dull due to oxidation and other environmental factors, leaving light output and your ability to see at night significantly reduced. Just looking for a quick, good clean? Let us hand wash and vacuum the interior of your car!